Review posted January 28, 2019. Note: This review was written after my first reading of the book, before I had discussed it with any committee members. The views are mine alone - and I gained yet more appreciation for this book when rereading and discussing it. And today I'm completely thrilled that this is "our" Newbery winner! Merci’s a very likable heroine and her conflicts and friendships feel organic and not stereotyped. Author Meg Medina reminds us that middle school comes with lots of changes, and some of those changes – like a grandparent aging – aren’t good changes. But with the help of family and friends, we believe Merci’s conclusion that she’ll be able to switch to a more difficult gear and ride on. 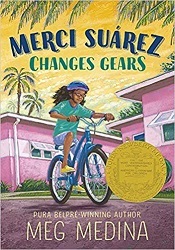 Here's what the Newbery committee wrote about this book: "Using humor and grace, Merci, a charming and plucky protagonist, cycles through life’s challenges with the support of her intergenerational family. This richly nuanced novel tackles the complexity of navigating a multicultural identity amidst changing family dynamics."